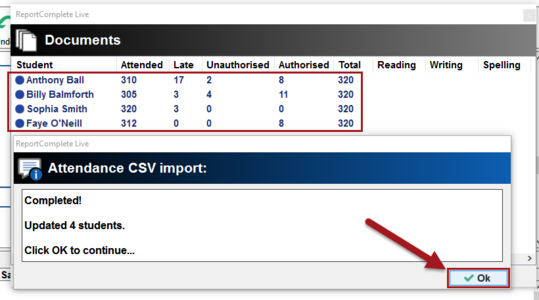 Teachers can enter attendance manually or you can enter it via a CSV file. 1. Create a CSV file that contains your attendance information. The column headings should include UPN, Present AEA (or Attended if not available), Late (optional), Unauthorised and Total (sometimes called 'Possible sessions'). 2. Click Admin>Documents. Then once the Documents window appears, click the 'Attendance' button. 3. You will see a message asking if your CSV file is ready and it it contains the correct column headings. Click 'Yes'. 4. Once imported you will see the attendance information in the Documents window. 5. In the actual report you will see that the information has been added/updated. This page was last modified on 29 June 2018, at 02:35.